After mysteriously disappearing from the Black Lion at the end of Season 2, Shiro escapes a second imprisonment with the Galra and returns to the Castle a bit… quickly and conveniently. On his way off the prison ship, he has some odd memories of seeing another version of himself as well as the remembering the words “Operation Kuron”. Among other speculation, the similarity of this word to the Japanese for clone (クローン/kuro-n) has led to a lot of theorizing (that I’m totally on board with) that the Shiro who escaped so easily is some kind of Blade Runner/sleeper agent fake of the real Takashi Shirogane. While there weren’t any particularly clear clues in the actual season hinting at this after Shiro returned to the Castle, this story digs into the possibility that the returned Shiro is a clone with both hands. Like puzzle pieces that look like they should fit, but you try to stick them together and they don’t quite go. Like an instrument just out of tune, a map turned slightly clockwise. It grates against her skin, her bones. It itches. She doesn’t have a name for it, the way everything’s all right but not-quite-really. She searches for it, like a word puzzle (she used to be so good at Boggle), in the way Shiro walks and talks. The way he smiles a little wider than he used to, the way he doesn’t take as long to brush his teeth. He takes twelve steps to cross the kitchen hallway. He tells Hunk and Coran that dinner is “fantastic.” The Black Lion doesn’t want him. It’s wrong, it’s wrong, it’s wrong. I love this fic in part for its characterization of Pidge, as it gets into the difficulties of identity and dysphoria that she faced, first as a kid realizing she identified as female, and then in falsifying her identity and going to space as a boy despite that in order to rescue her brother. 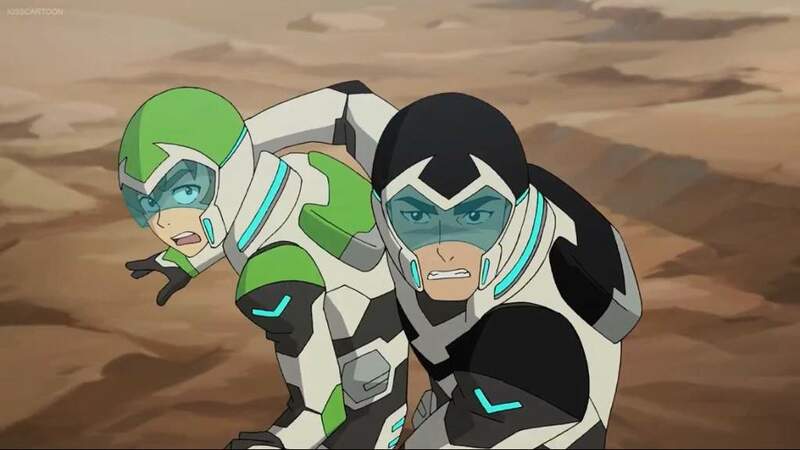 It also gives me that good good Pidge + Shiro relationship; while I’m all about that Sheith life when it comes to shipping, I love that it’s Pidge and Shiro’s platonic, siblingy relationship that gives Pidge the edge in realizing that the Shiro who came back is not the Shiro she knows and cares about—something none of the other Paladins or their allies are able to discern. This fic is less than 4,000 words, so it’s a quick and enjoyable read and a very satisfying coda to the brief amuse-bouche of story that Season 3 gave us. The next six episodes (“Season 4”, also known as “the rest of Season 3”) drops in October, and hopefully we’ll get more deets on what’s going on with the Kuron biz then, but until then, I highly recommend you check out this story at the AO3. This entry was posted in Cartoons, fanfiction, fanfiction fridays, Science Fiction, tv show and tagged greenglowsgold, katie holt, Pidge Gunderson, season 3 spoilers, Shiro, Takashi Shirogane, trans characters, vld, Voltron, Voltron: Legendary Defender, What's my name? by Lady Saika. Bookmark the permalink.